If you are for working for corporate America, it is likely that you’re compensated well. But at what expense? For today’s guest, getting good pay also meant missing out on quality time with his family. Jesse Andrews is a passionate and focused TTP student from Rhode Island. 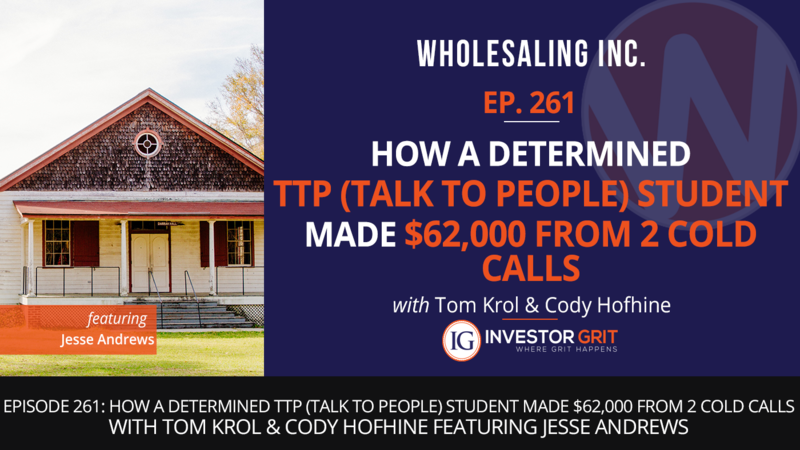 While he was not consistent with his wholesaling efforts when he first started, things took off dramatically when he joined the TTP program and dedicated his time to wholesaling full-time. From once feeling like he’s not getting anywhere, Jesse now runs a thriving wholesaling business that’s generating huge amount of profits. In fact, he earned a staggering $62,000 from just 2 cold calls! If you are considering leaving the corporate world and giving wholesaling a try, today’s episode would be perfect for you. You’ll not only learn powerful techniques and insights from Jesse, you’ll also be inspired by his success!